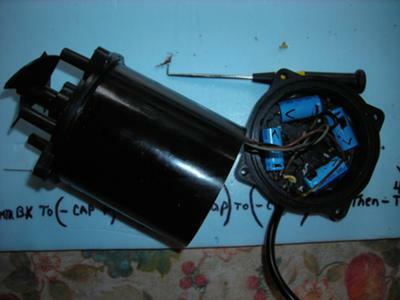 I have repaired (2) pump motors now, instead of purchasing them for the outrageous $$$ that they go for new. First my own about 6 years ago by purchasing (4) new capacitors (63v 430uf) and soldering them to the circuit board in the same configuration that the bad ones were. When I opened the motor by removing the (4) screws,( THE FORBIDDEN ONES, according to a picture I've seen on this site) which said replace the motor instead, I could see the caps were oozing a black silicone type of substance out of the ends. I managed to save the oil that comes out when you open up the can the motor is in. Didn't replace the top and bottom rubber gaskets that seals the oil from leaking out. Still running and cleaning my pool fine after all these years. Second motor I just did today, it belongs to my brother and is a little later model, but same motor. Capacitors were encased in some type of resin that doesn't allow such easy access to them, so my brother gouged them out with a screwdriver which made it a challenge to put back in proper order and to read positive and negative connections as they were crushed and connections came apart. For the remaining resin still covering important info, like arrows pointing to positive ends and capacitor values, I sprayed with WD40 which allowed me to peel it off easy and fast. The cap values were different than my slightly older model, ( 63v 680uf ) also (4) of them. Found them online for $10 shipped, soldered them in and motor started right up before drive motor( which is normal) and ran excellent. Only small problem I have, is my brother lost the oil and I haven't yet found any info on what type of oil goes in them yet. I could use some help with that, if anyone knows. But one thing I found through these experiences is that the motor doesn't go, the caps do. And if you have patience and can solder, you can save a good amount of money by fixing it instead of trashing it. Not to mention how good it feels year after year watching it doing it's job and costing you only $10 & change.